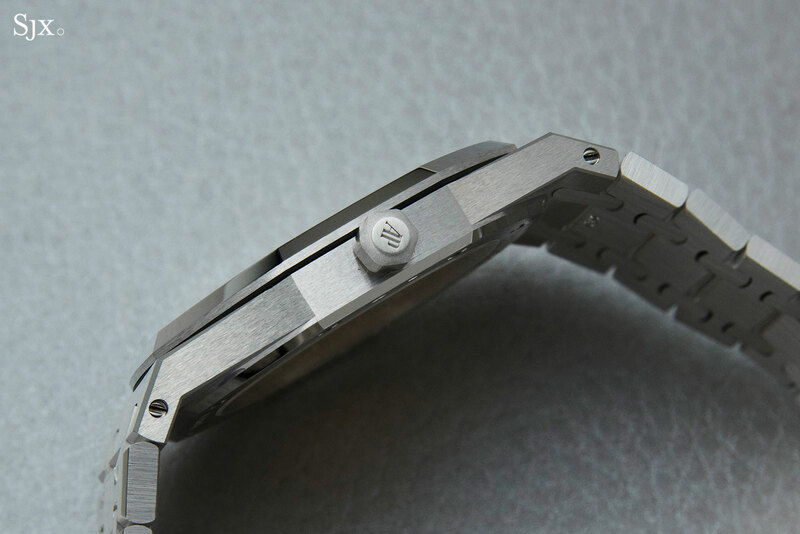 The Royal Oak Extra-Thin in white gold is a good-looking watch. Already the Royal Oak “Jumbo” is a beauty, angular without being aggressive, wide yet flat, and seemingly timeless despite having been born in a decade that didn’t produce many classics. And in white gold with the dial in “salmon” (or copper or pink gold), it gets even better. But the caveat: the watch was announced as a 75-piece limited edition on the first day of SIHH 2019, leading to a mad scramble for one. But that was a mistake according to an Audemars Piguet spokesperson, who also added that several other watches were wrongly labelled as being limited editions. The Royal Oak Extra-Thin in white gold was, from the beginning, intended to be an edition of 75 pieces per year. Numbers aside, it still is an gorgeous watch, and will still be exceedingly rare. The combination of white gold and “salmon” is uncommon both ways. 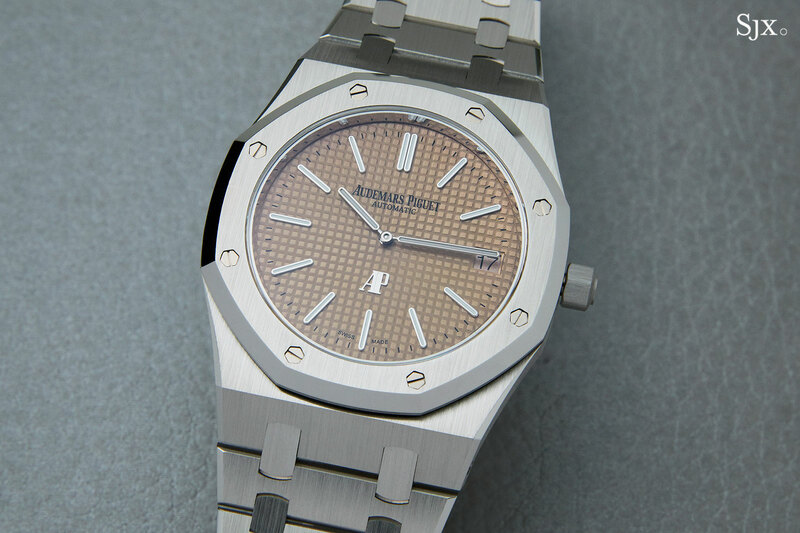 The metal is uncommon as Audemars Piguet only produced a few examples of the Royal Oak ref. 5402 in white gold in the 1980s. And ditto for the dial colour, which was found on a portion of the 700 steel Royal Oak Jubilee watches made in 1992 (the rest were blue-grey), though the dial of the Jubilee limited edition was more pink than today’s white gold model. 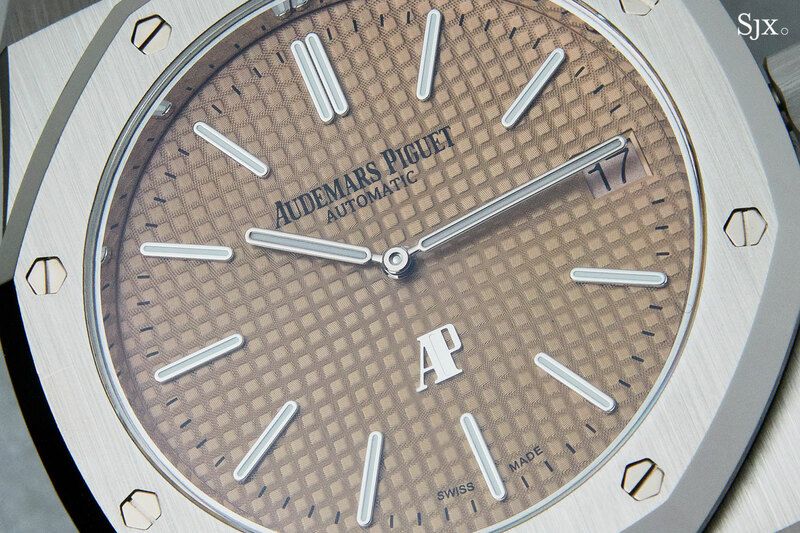 As is standard with most Royal Oaks, the dial is engine-turned by hand on a rose engine, giving it an intricate chequerboard motif that Audemars Piguet labels petite tapisserie. The dial is not quite pink or salmon, but a cross between yellow and gold that is striking, especially in contrast with the white gold case (which is white-white, more on that below). And its designers smartly made the date disc almost the same colour as the dial (the disc is a bit more pink), making it unobtrusive. In its original steel the Royal Oak feels refined and precious thanks to its delicately finished case that artfully shows off the contrasting brushed and polished surfaces. In white gold it’s even better, just because it looks and feels more expensive. Stainless steel, being mostly iron, has a greyish tinge to it. White gold, on the other hand, has a brighter, more luxuriant colour with a more pronounced silvery tone. That being said, most white gold has a yellowish hue that is often camouflaged with rhodium plating to give it a bright white colour. The Royal Oak in white gold has a plated finish, giving it a brilliant silver colour that looks really, really good. A giveaway is the contrast in colour between the bezel and hands, which are rhodium-plated white gold, against the natural finish white gold hexagonal nuts in the bezel. Needless to say the finish of the case and bracelet is par excellence, though it means scuffs and scratches show up easily. The cal. 2121 inside is both a strength and a weakness. It originally made its debut as the Jaeger-LeCoultre cal. 920 in 1967, but only as a ebauche, or movement blank, which Jaeger-LeCoultre supplied only to the “holy trinity” of Swiss watchmaking, Audemars Piguet, Patek Philippe and Vacheron Constantin. That the movement is over 50 years old yet still used with pride by both Audemars Piguet and Vacheron Constantin (though each now manufactures the movement itself) is a testament to its brilliant and elegant engineering. 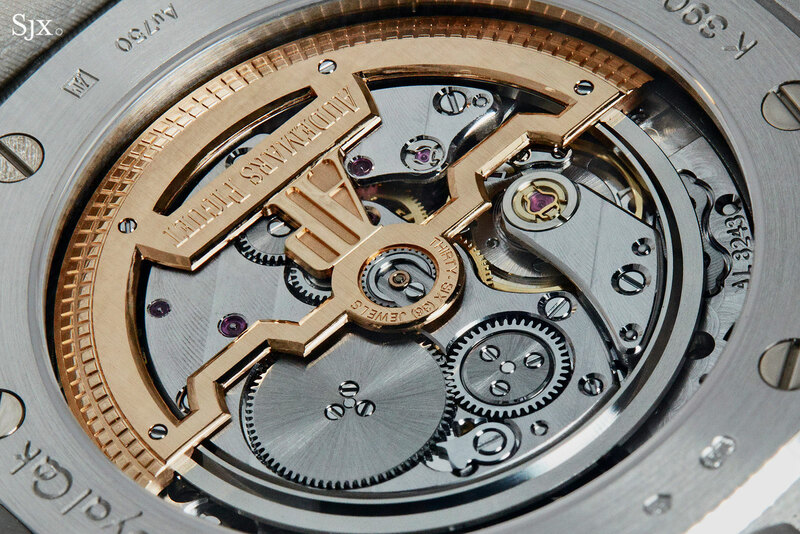 It’s still one of the thinnest automatic movements on the market, and unusually amongst slim movements, is fitted with a full rotor that sits on a beryllium ring supported by four ruby rollers. But with its slimness and age comes two drawbacks. One is the relatively short 40-hour power reserve, and the other, which is more significant, is the lack of a quickset date. Advancing the date means repeatedly going back and forth between 9pm and 1am to advance the date one day at a time, which can be a massive hassle especially with the small crown. But because the Royal Oak “Jumbo” is the Royal Oak “Jumbo” with the cal. 2121 inside, the inconvenient date is a fact of life, just like how the Bugatti Veyron has only two seats. 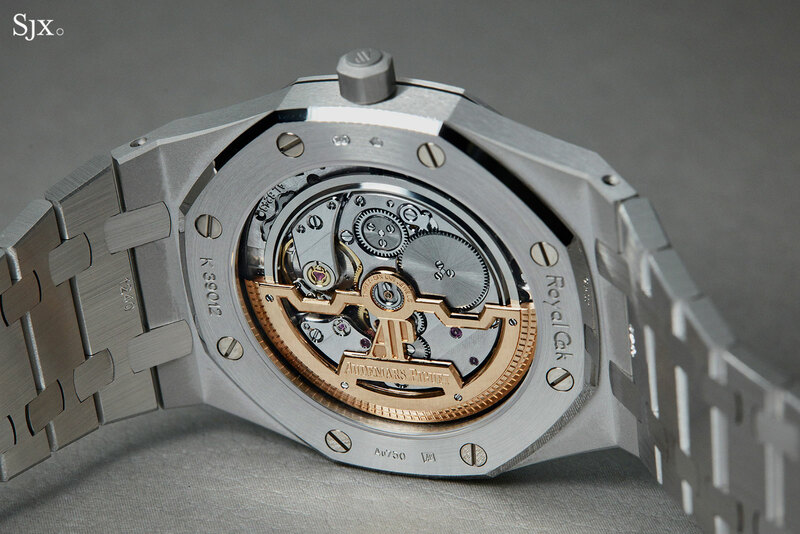 Audemars Piguet has improved the movement over the years, mostly invisibly in order to improve it functionality and robustness. 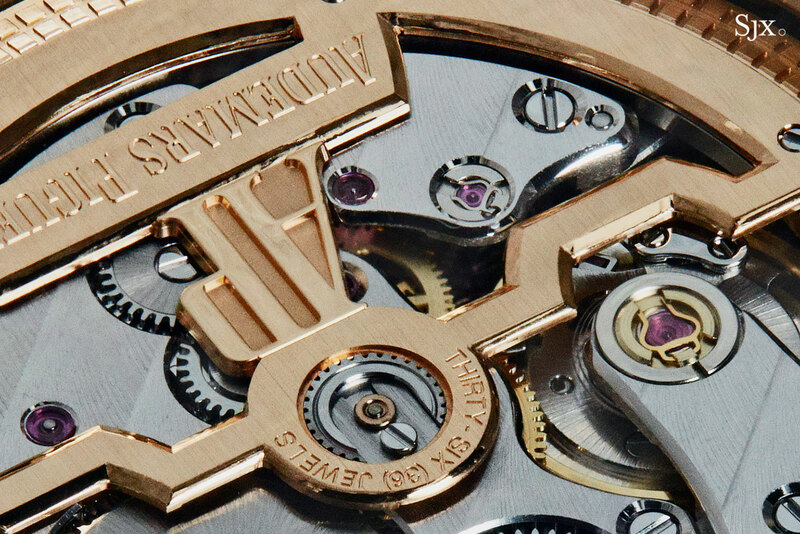 But the decorative finishing of the movement has also progressed, compared with an example from 20 years ago. The jewels and screws now sit in more pronounced countersinks, while the bridges have polished bevels (as opposed to stamped anglage). It’s worth noting that the 22k gold rotor is finished to a higher degree than the movement bridges, with its edges having wide bevels that are polished by hand to a mirror finish. Compared to last year’s Royal Oak “IP” in titanium and platinum, the white gold version is significantly heftier, but it’s a reassuring weight. The delicate surface of the gorgeous white gold is more of a concern, since it marks extremely easily. The angular form of the Royal Oak translate into a slightly more angular feel on the wrist when compared to its great rival from Geneva (yes, the Patek Philippe Nautilus), which has a more rounded form. But because the Royal Oak “Jumbo” is so thin, it wears well. What is an inconvenience is the difficultly of getting an ideal fit for the bracelet. As the links are relatively large, a perfect fit is sometimes only possible with a “1.5” link that’s one and a half times as large as a standard link. The link has to be ordered as an extra and in precious metal costs about US$1000. The Royal Oak Extra-Thin “Jumbo” in white gold (ref. 15202BC.OO.1240BC.01) is priced about US$55,000, or S$77,700. It’ll be available only at Audemars Piguet boutiques. Correction January 29, 2019: Included a comment from Audemars Piguet spokesperson explaining the watch was originally intended as a 75 piece run per year from the beginning.